Fourth Graders study Jews around the world. The year is filled with the history, traditions, music, rhythms, religious customs and dance of different Jewish communities around the world, such as the Sephardim of Spain and the Ashkenazim/ Hassidim of Eastern Europe. 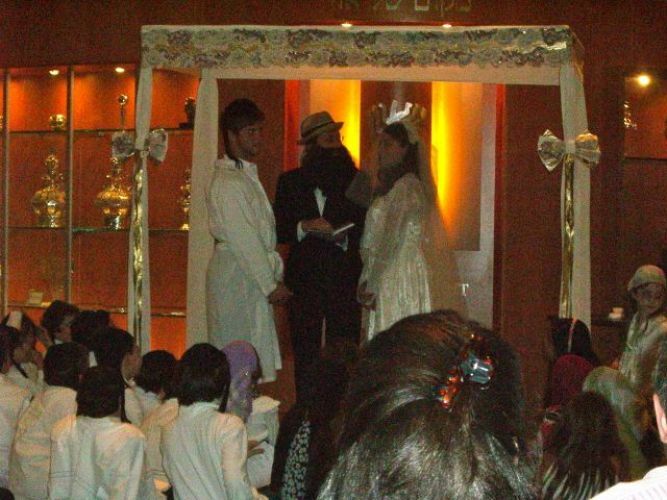 Fourth Graders celebrate with a very special Havdallah Hispanica and a mock Hassidic Wedding! Fourth Graders also participate in a community-building weekend retreat. Beginning in Fourth grade, our students are placed in leveled groups for Hebrew learning each week. Their Hebrew learning focuses on continued learning of the letters and vowels, learning our prayers, and practice with increasing fluency in Hebrew de-coding and reading. In the Spring parents attend informational meeting and submit date requests. 4th grade girls dancing "Ki Eshmera Shabbat" from their unit on the Jews of Spain.